The purpose of this paper is to report the findings of a systematic review of literature in green marketing domain and to propose directions for future research. Green marketing issues are delineated from literature extending marketing orientation and marketing mix frameworks. As society becomes more concerned with the natural environment, businesses modify their behaviour in an attempt to address society's concerns. Based on the literature review, the conceptual review and direction for future research have been delineated and discussed. The paper concludes with the evidences of integration between sustainability and marketing in forms of corporate environmental actions and green marketing practices in businesses. 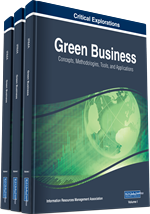 The paper deals with the concept of 4-Ps and the green marketing practice as business response to the increasing environmental consciousness of consumers in the market. The discussion highlights future research avenues and consequent implications for marketers of green products in designing their marketing strategies. Convergence of sustainability thoughts in marketing has given rise to addressing environmental issues in marketing (Hult, 2011). It believes that economic growth has greatly influenced by society and ecology, and emphasizes upon adopting a variety of management approaches (Crittenden et al., 2011) that reflect business responsibility for the wider societal good (Matten and Moon, 2008). This gives an opportunity to elevate its focus from meeting the needs of consumers to managing a broader market-related issues related to economy, society and the natural environment. This has given rise to the debate to incorporate social and environmental impact along with economic performance in business assessment. In result, rising worldwide public concern over degrading environmental quality resulting from harmful effects of certain industry practices and stricter environmental regulations posed by governments across the borders can be witnessed. This has altered established norms and rules of business across the world, and has raised the need to adopt environmentally friendly approaches in their sourcing, operating, and marketing activities for companies (Banerjee, 2002; Menon and Menon, 1997). So, companies embrace ‘ecological consuming approach’ perspective to ensure their survival in the market. They now address environmental issues in their management (Pujari et al., 2003; Beamon, 1999) and marketing decision-making (Wong et al., 1996). And, they choose to differentiate themselves by meeting the stricter national and international environmental regulations and demands of environmentally-conscious consumers (Banerjee et al., 2003; Polonsky, 1995). They address environmental issues in several business activities such as designing and manufacturing products, their pricing, distribution and promotion, and develop green marketing practices and strategies (Papadopoulos et al., 2010; Gurau and Ranchhod, 2005). This approach of green marketing is perceived as a profitable and sustainable management process to identify, anticipate and satisfy the requirements of consumers and society (Chan, 2013). Thus, once limited to the ideology of activists, environmental consciousness has become a matter of market competition (Follows and Jobber, 2000).